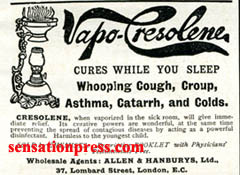 'Joy's Cigarette's afford immediate relief in case of asthma, wheezing, winter cough, and hay fever, and, with a little perseverence, effect a permanent cure. Universally recommended by the most eminent physicians and medical authors. Agreeable to use, certain in their effects, and harmless in their action, they may be safely smoked by ladies and children.' Wilcox and Co..